Freestyle Technique Lesson Series | Mediterra - Swim & Run Better Than Ever! Master the fundamental skills of the freestyle stroke in 4 sequential lessons. You’ll be amazed at our more sensible, more successful approach to building superior swimming skill. You’ll swim better and enjoy practice more than ever. Whether new or experienced, you’ll greatly improve fundamental skills for a balanced, alignment, and streamline. This will put you in position to acquire superior stroke timing and a seamless, rhythmic breathing pattern. Your instructor provides in-water demonstrations, hands-on guidance, feedback and encouragement to super-charge your small group learning and skill development. Up to 4 students per group. 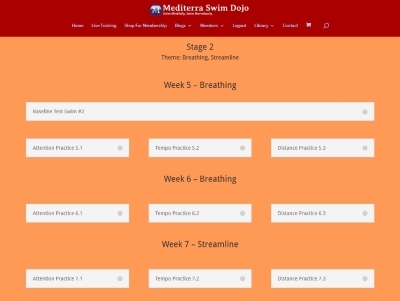 Access your lesson notes, follow a training course, maintain a dialog with your coach, and study our abundant library of supporting materials with a 3-month membership to the Mediterra Dojo, our online training site. Again, thank you for a great experience. It taught me some fine points in technique that eluded me before. It allowed me to feel what you meant by synchronization, and challenged me to connect the two. More importantly it brought me back to mindful swimming. A practice that I have lost over the last couple of years. I hope to continue, and let my new knowledge become a natural part of my swimming. consider setting up a private training series on days and times more suitable for you. Each lesson is approximately 90 minutes in the pool. The course is held at Courthouse Club Fitness South River Road club on Thursday evenings, 6:30 pm to 8:00 pm. There is no series in June. Course starts promptly in the water – please arrive a little early. Part 1 is composed of Lesson 1 and 2 – Learn balance, core stabilization, streamline shape, recovery arm and streamline breathing. Part 2 is composed of Lesson 3 and 4 – Learn the underwater catch/hold, torso power, ideal stroke timing, and rhythmic breathing. Many swimmers attend again as a review and pick up so much more the second time through. Take one part or both parts as needed. 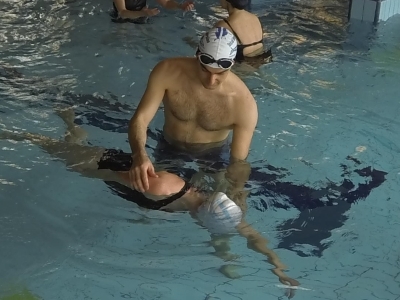 Our principle-based Total Immersion learning method will guide your body into the safest, strongest, longest lasting movement patterns for swimming. These activities will strengthen attention in the mind, and improve control over the body. You will acquire an improved relationship with your body and with the water. We will start with drills then emphasize whole-stroke practice with focal points to help you imprint new skills. These lessons are taught in a critical sequence. Missing one of first three would make it difficult to step into the following lesson. If you miss a lesson and need to make it up there is an $80 makeup lesson fee. You may schedule that makeup lesson with your coach at a mutually convenient time before the next lesson in the sequence. We are pleased to gently work with those who may feel strong fear or anxiety in the water. We recommend that you start first with a private lesson or with our Pool Comfort course to experience our method for removing that stress from your water experience.